Spanish-inspired costumes can be a fun and festive way to celebrate the Spanish culture. With a few ideas and a little creativity there are a variety of characters and costumes you can choose from to create a Spanish-themed costume. 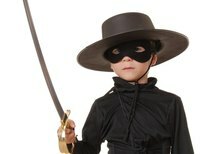 A popular costume for adults and children is Zorro, the popular Spanish superhero. Simply make a black eye mask using a scrap of black cloth and cutting out holes for the eyes. Wear a white, ruffled shirt, black pants, a black cape and a sword attached to the side of your waist. To be a matador wear a collared, white shirt tucked into black or red pants, and black dress shoes. Complete the look with a matador hat, which you can find at most costume shops and a red cape. For added effect have a another person or your pet dressed up as a bull. For girls a traditional Spanish senorita costume is characterized by long flowing skirts of vibrant reds, oranges and black, usually with lace trim, a flowing white blouse, and finger cymbals or a tambourine to play while dancing. Pull your hair to one side in a low bun and add a red or white flower blossom to finish it off. You may find senorita costumes at a costume store. For a male senor costume, all you need is a colorful traditional Mexican poncho, along with a sombrero, both items may be available at costume stores. You can add decorative facial hair like a mustache, and even add mariachis for a musical touch. You can also use brightly colored fabric of orange, red and or black, to make your own poncho;simply cut a small hole in the center of the fabric to go over your head. For a fun and flirty look, women can dress up as Charo, the popular Spanish icon who became famous in the 1970s. For this you’ll need glitzy gear like a brightly colored sequin jumpsuit or a sequined blouse and sequined pants. If your hair is a light blond and past the shoulders, simply tie half of it in a ponytail atop your head and curl the ends. If you are not blond, you can purchase a long blond wig and style it.